With just under 10 weeks until ROAD TO GLORY 2 comes to the East Midlands, 24 of the country’s top professional kickboxers are now heading into the first phase of their training camps as they prepare for the biggest show of its kind in the UK. Promoted by Suggy’s Gym in Newark, the event at Lincolnshire’s Grantham Meres 1,500-seater stadium on Saturday 7 October features fighters from some of the leading gyms across the country on what promises to be an incredible night for both contenders and fans alike. Among the stars of the show will be those taking part in an explosive 8 Man Lightweight Tournament. And with £5,000 prize money at stake, together with the opportunity for the two finalists to secure deals to appear on GLORY, the world’s leading kickboxing promotion, the eight men will have everything to compete for on the night. Four seeded fighters will be selected by GLORY ahead of the draw for the quarter finals and the announcement of who goes up against whom in the first round. “Details of six of the contenders have already been released and we can now confirm the names of the final two, local fighter Ammari Diedrick from 4th Dimension in Long Eaton and Paul Norton of Chupasart Gym in Dublin,” said promoter Dean Sugden. “These two should add an interesting dynamic to the mix, joining Marcel Adeyemi (The Knowlesy Academy, Edgeware), Leyton-Reece Collymore (Franks Gym, Manchester), Vinny Church (Backstreet Dojo, Sunbury), William Goldie-Galloway (Pure Impact Muay Thai, Blackpool), Giannis Skordilis (Storm Gym, Luton) and Alex Bublea (The Knowlesy Academy, Edgeware) to battle it out for places in the semi-finals and the final. Victories in his three bouts on the night will see the ultimate winner walking away with a £2,000 purse, with both men in the final being awarded two-fight deals to appear on the GLORY stage. 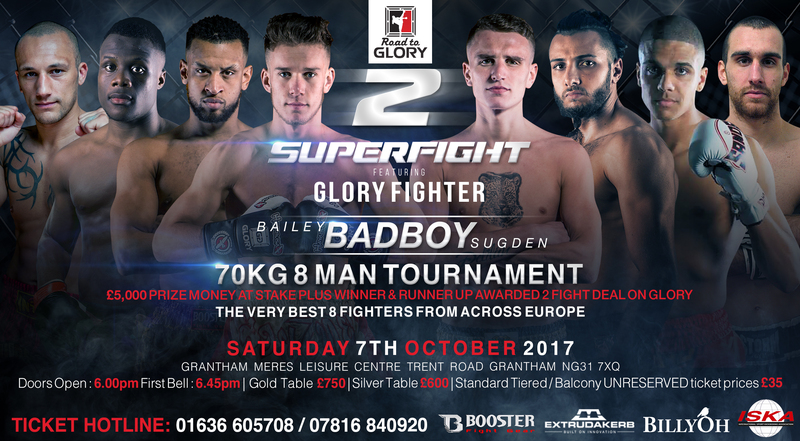 Also on the Grantham card are three equally exciting Super Fights, one of which features GLORY Featherweight and local fans’ favourite Bailey ‘BadBoy’ Sugden of Suggy’s Gym in Newark. “His opponent’s yet to be confirmed although we’ve made an offer to Mo Abdurahman, who fought Bailey in the final of the 8 Man Tournament on the first Road To Glory in March,” said Dean. Completing the main card are two more Super Fights, both at Welterweight. In the first, former ISKA World Champion Reece Rowell from Essex Kickboxing takes on the current ICO World Champion Karl Johnston from Jesters in Matlock. Road To GLORY 2 comes hot on the heels of the hugely successful first RTG at Grantham in March, after which four of the fighters taking part were signed by GLORY. Three have already made their GLORY debut, with Jamie Bates first up scoring an emphatic win in Copenhagen over Richard Abraham in the Welterweight division. Featherweight Bailey Sugden was up next, dominating his more experienced opponent Arthur Sorsor both technically and physically to take a decisive unanimous decision win on the card of GLORY 43 at New York’s iconic Madison Square Garden. Also fighting at Featherweight on the same night, Mo Abdurahman was knocked out in the first round, demonstrating the importance of bringing your A game and a good chin to compete at this level. Still to come is Adrian Maxim, the fourth man signed by GLORY after fighting in Grantham in March, who faces France’s Victor Pinto in Chicago on Friday 25 August. “This has been a massive boost for us as promoters of the feeder show here in the UK,” said Dean. “It shows just how much talent we have across the country and reinforces my belief that some of that talent can go on to represent the UK on the world stage. Doors open for Road To Glory 2 at 6pm, with the first bell at 6.45pm. Tickets for the show – which also features five more professional fights on a talent-stacked undercard – are £750 for Gold Ringside Tables, £600 for Silver Ringside Tables (both 10 per table) and £35 each for unreserved tiered and balcony seats, all available now from Suggy’s Gym, 49 Castlegate in Newark or via the ticket hotline 01636 605708 or 07816 840920.